At Davam Urgent Care, we offer after hours pediatrics for the residents of Spring, TX, and its surrounding communities. When your’ child and loved ones are suffering from a non-life threatening illness, our clinic is available to treat them 7 days a week. There is no need to wait days, sometimes weeks, to get in with your childs pediatrician or spend thousands of dollars at the free-standing emergency room to insure that your child gets to feeling better. Each child will be treated by a board certified medical provider and get to experience our kid-friendly pediatric room. We also have IPads available in the lobby area with games to keep your kiddos entertained during their short wait time. Non- Life Threatening Pediatric Illness and Injury Treatment- We are able to provide care for a wide variety of illnesses and injuries. This includes strep throat, sinus infections, flu, bronchitis, lacerations, ear infections, fever, dehydration, bone fractures, pink eye, vomiting, rash, and many more. Sports and School Physicals- School and sports physicals are available 7 days a week, 8am-9pm, for only $25. Walk-ins are welcome. These physicals are often required for children entering school or participating in any athletic activity. X-Ray and Lab Work- Our clinic is fully equipped with a digital x-ray machine and certified lab. Having both services in-house allows for a more efficient visit to get your child back to their best health. With convenient hours of 8am-9pm 7 days a week. 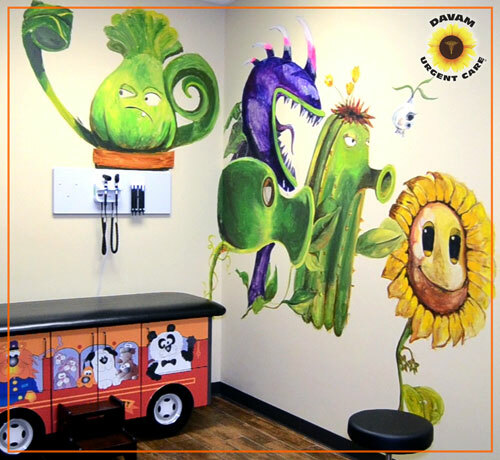 Davam Urgent Care is the best choice for after hours pediatric care located near Spring, TX. We are also open most holidays, including days when kids are typically out of school. Patients also have the option to check-in online through our website which allows for shorter wait times. Davam Urgent Care serves the Spring neighborhoods of Augusta Pines, Auburn Lakes, Klein Meadows, Harmony, Dulcet Hollow, and more. For more information please contact us at (281) 583-1980.